"De artibus et coloribus romanorum" is the name of a book by the late-antiquity author Eraclius. He gathered some (sometimes strange) recipes concerning production and processing of colours; it is – apart from Pliny and Vitruvius – the most important primary source in my library. There are some shelf meters of other books, both antique and modern, circling around the topic "arts in antiquity" (with a focus on Rome and even more focus in the late first century a. d.). Add some journeys within the Empire (Roman) to this, visits to museums and learning from people considerably more clever than me: that's how I gathered my knowledge. 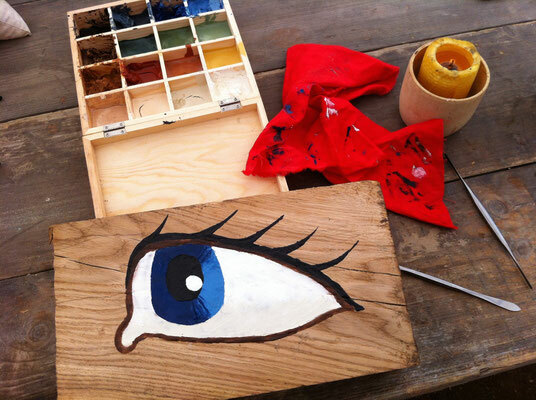 Alas, knowledge isn't everything when it comes to art: then, you need craftsmanship. I studied graphic design/communication design and am today (2019) still working in this job, in my 27th year. Painting is, nonetheless, something quite new for someone who sat behind monitors almost since 1990. Well, I try my best. Pliny, renowned Roman polymath, tells us of two kinds of Roman colours in the 35th chapter of his "Natural History": "Earth Colours" (umidus) and "Blooming Colours" (floridus). 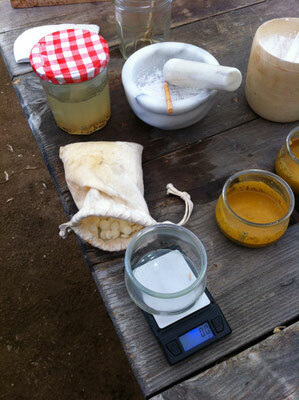 To be precise: he talks about raw materials and pigments which can be processed into these pigments or paints. What's so different between these two kinds of colours except, as the name suggests, luminosity? The price. 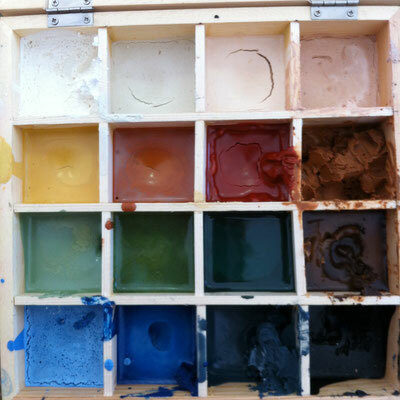 "Earth Colours" are, on the average, fairly common, easy to process and therefore cheap: these are pigments like Ochre, Umbra, Green Earth or Lead White. "Blooming Colours" are rare and hard to work with: Azurite (blue), Malachite (green), Cinnabar (red), to name a few. These colours were separately offered and billed. 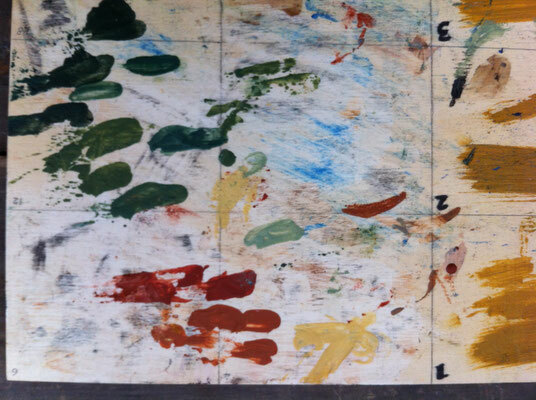 On common paintings, those pigments were used sparingly. Emperor Augustus' wife Livia had a great dining room painted as a garden, with trees, flowers, birds, fruit and a great big blue sky covering walls and the entire ceiling. Now that's a statement. Not all of these colours were "natural", some were created artificially, chemically, like Lead White, Minium or "Egyptian Blue". Some were poisonous, like Lead White or the "Gold Colour" Auripigment (which is based on arsenic). These poisons and their effects were known, there are no stories about painters dying for their art (by poisonous colours). Up (in bottles, from the left): Azurite, indigo from wode, egyptian blue. 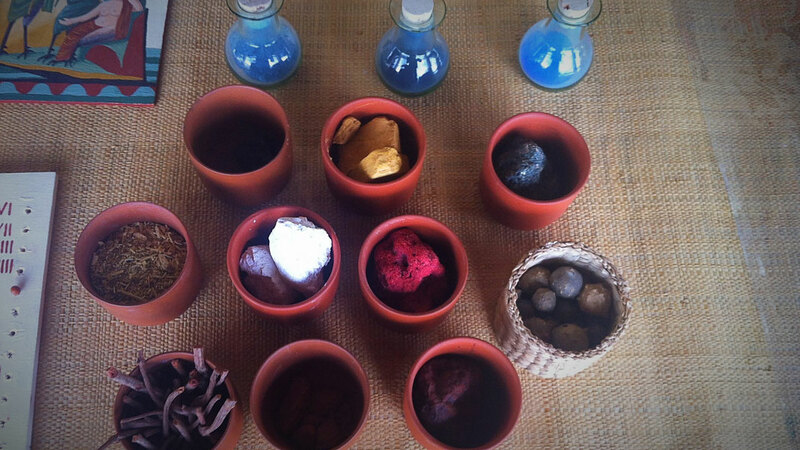 First row (pots): Azurite, gold ocre, green earth. Middle row: Reseda, chalk, cinnabar, galls (basket). Lower row: Krapp roots, ruddle, red ocre. 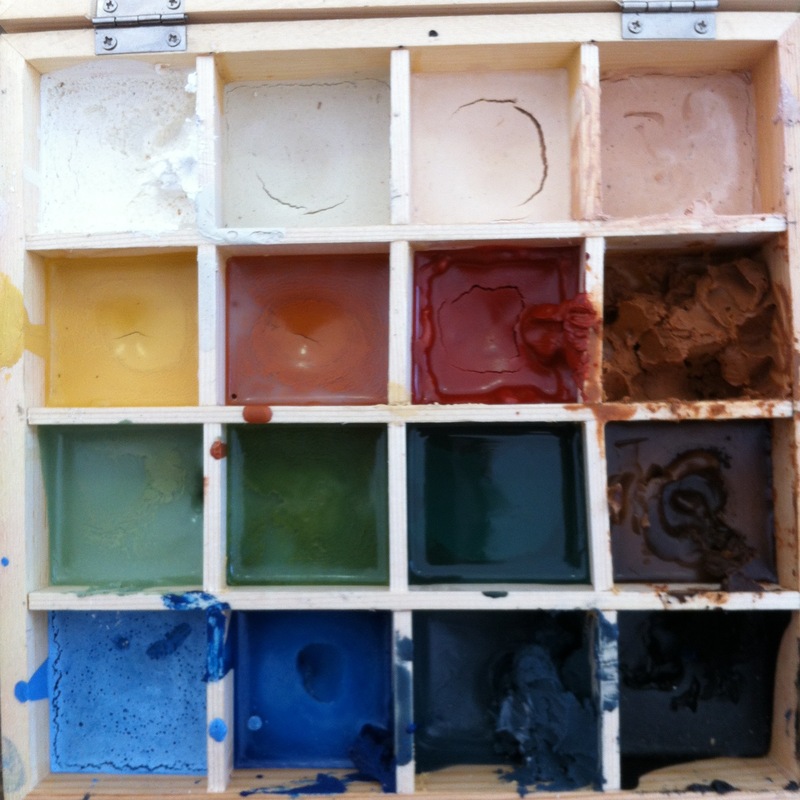 Binders are needed so that the ground powder pigment sticks to a panel and doesn't fall off. The oldest known binder is Tempera, which means "mixture" in Italian. Literally, almost every binder is a Tempera, and there are quite a few; my Tempera requires eggs, linseed oil and water. I got this recipe from Dr. Kremer, head of the wonderful company Kremer-Pigmente. 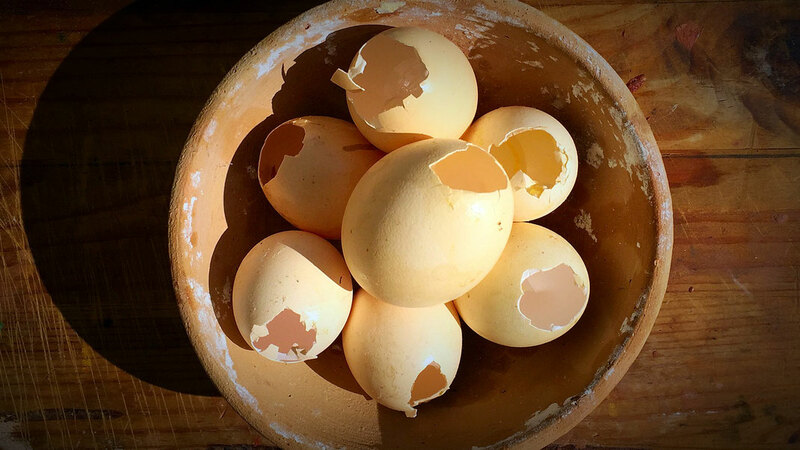 The recipe goes like this: open the egg carefully at its top, so that all its content remains inside and the shell can be used as a measuring cup. Put both egg white and yolk into a cup. 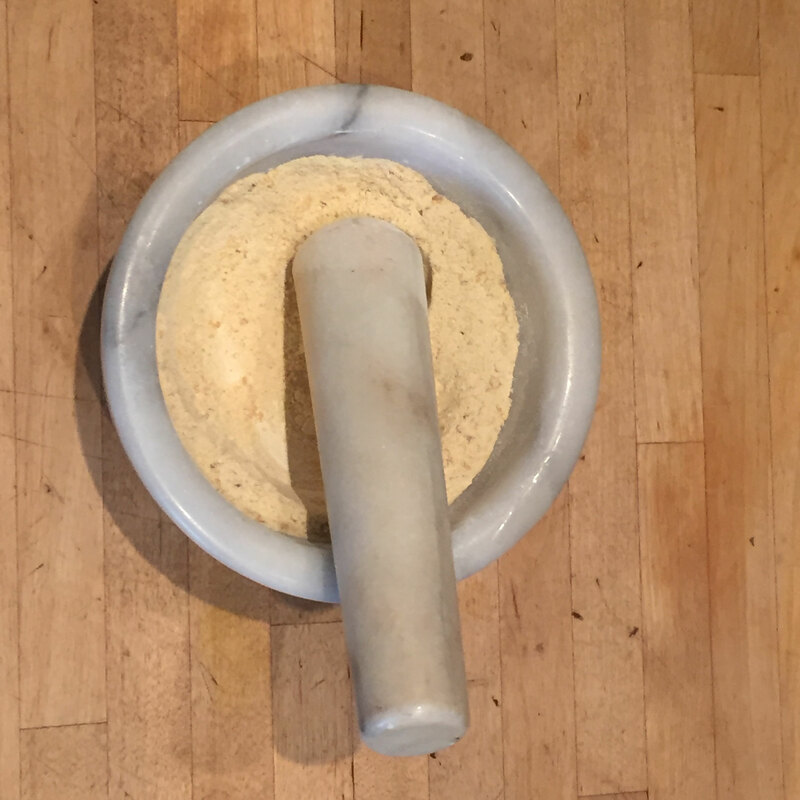 Fill the shell with linseed oil, add it to the egg; fill it again with water (and add it, too). Now you have a reasonable precise mixture of 1 : 1 : 1. Stirring comes next. Continue until there are no more bubbles of yolk (or at least very small ones). Mix small spoonfulls of Tempera and ground pigment until the paint becomes a soft semi-fluent stuff like ketchup or mustard. Go ahead and paint with that (just add water sometimes and keep your brush wet). This art is renowned for the brilliant mummy portraits excavated by Flinders Petrie, late in the 19.th century, in Fayyum/Egypt. Reconstructing this technique is somewhat adventurous. The early-20th-century researchers of this "wax colour, applied hot", Berger and Schmid, identified wax, resin and linseed oil as the basic elements of this binder, but they did not write (care?) about the proportions of the mixture (and Schmid even patented his formula). 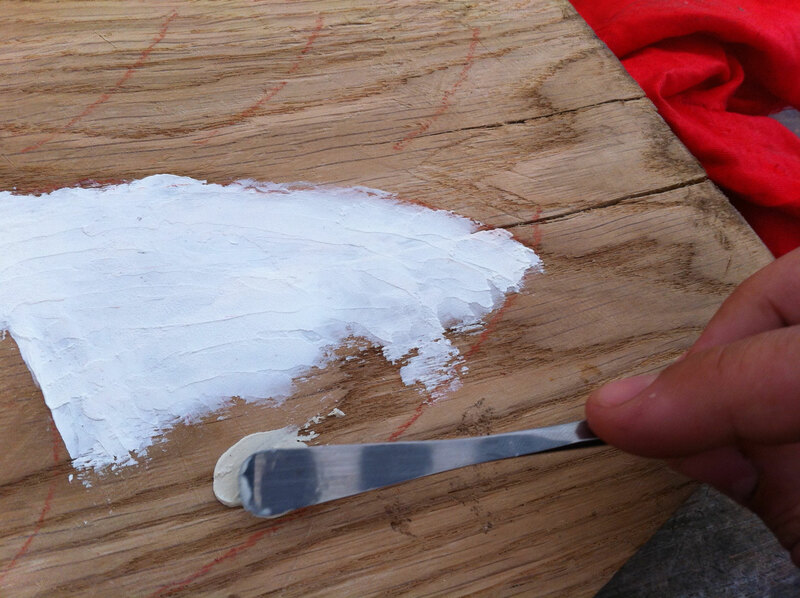 My own research in the summer of 2014 evidenced best results with a ratio of three equal weight parts, just like with the tempera (which uses a volume measure). I have to admit that I've used liquid resin, re: stirred ground resin with turpentine to make it "fresh" again. By doing this, I probably evaded one of Schmid's bigger obstacles, who complained about the paint being so sticky, it strung. Encaustic is the "high art" of antiquity, ,the profession demanding a high degree of skill and craftsmanship, which to acquire I simply don't have the time (I do this in my spare time, mind you). Compared to the "commercial art" of Tempera there are quite a few mentions in sources where wax painting is being mentioned, there are even pictures showing painters at work. By this, we know about closed, partitioned boxes of colours, three-legged easels, spatulas made of metal being warmed over some heat sources (coals, probably). The challenge is simple: if I cannot paint like this, I'm doin it wrong. Experiments with this technique aren't finished yet (and won't be for a long time). 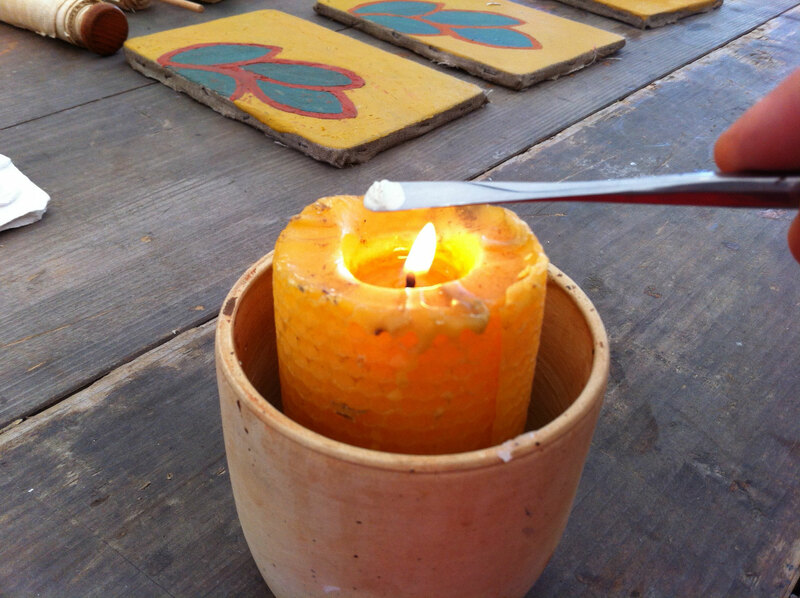 By the way: the notorious "Punic Wax" is just a polish and has nothing to do with painting itself.